The Historic Monuments of Dengfeng in "The Centre of Heaven and Earth" are 8 groups of sites located at the foot of the sacred Mount Songshan. I spent 3 days exploring all inscribed components during a 4-day Qingming holiday weekend. My visit was possibly a few days before Juha’s and I concur to his impressions on the review below. As he had excellently written about the components he visited, I will focus mine on the others in a lengthy review. Shaolin Temple is the birthplace of Kung Fu. Visiting it was worth the hype and hassle. Yes, it is crowded and considering I went on a public holiday, it was really ”people mountain people sea” type of place. The payoff is not solely on the exceptionality of the built heritage. After all, when you’re templed out, seeing one you’ve seen them all. Rather, it is on the overall experience, especially on the little surprises, that I was rewarded. 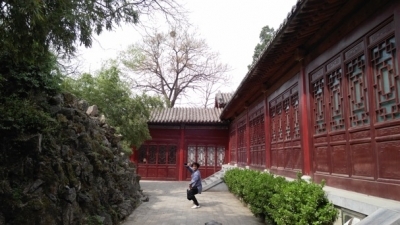 Within the Shaolin Temple scenic area are Kung Fu academies offering short or long term courses. If martial art is not your forte, you can just delight on watching the students/kids practice. Morning is best to see them doing exercises - it is not for show but as part of the school schedule. It is an amazing sight viewing them in rows with synchronised movement and dexterity. As expected Shaolin Temple Kernel Complex is the most crowded. 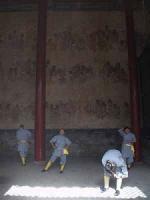 Notable relics are the mural depicting the Shaolin tradition and a bronze monk statue. Deeper into the compound are places of solitude where I was rewarded with a man practicing Kung Fu (in photo). It was exhilarating, I was the only spectator as he gracefully tumbled and danced. Not far from the temple is the Pagoda Forest, which served as burial grounds for monks over the centuries. The high concentration of pagoda in relatively compact area provides a pleasant stroll with a backdrop of Songshan. Climbing up the mountain and halfway to the peak is the Chuzu Temple. As one of the oldest wooden structure in China, the passage of time is evident on the temple and its compound. There is a somber atmosphere with a smell of old wood and you might hear a creak or two upon stepping in. Que gates are free-standing ceremonial gate towers serving as the boundaries of palaces and temple premises. Of the 34 extant Han Que Gates, three are in Dengfeng and provide a symbolic link to the mountain worship of this “center of heaven and earth”: one for Shaoshi peak, one for Taishi peak and one for the Qimu Stone. The center is believed to be Shaoshi and Taishi peaks. There is not much to see on the gates themselves, as unfortunately, they’re inside a shed which were all closed during my visit. Of notable interest is the area of Qimu Que. Behind the gate is a hiking path to the Qimu - a legendary rock that is cracked open with a baby inside named Qi (Qimu = mother of Qi). This component gives a semblance of “mythic origin”. Nowadays, there is indeed a huge rock cut in half but everyone is free to climb - so most likely a modern version and not the stone of legend or even its basis. Undoubtedly the best component of the series. ICOMOS evaluation singled out this monument to possess an OUV on its own. It bears testimony to the long Chinese tradition and contribution to astronomy. It’s relation to “centre of heaven and earth” theme is on the notion that precise astronomical observations can only be done at the center. Indeed, the measurements taken here have high precision and not far off from those taken using modern tech. Of the several instruments within the complex, the most imposing and grand is the Star Observatory itself. This building is a marvel of human ingenuity by giving precise measurements of tropical year without the use of modern gadgets. Made of bricks and stone, it is a 28-foot platform with a 98-foot stone sundial perpendicular to it. The gnomon used for shadow measurements is placed across a groove at the top of the platform. In 1944, Japanese troops bombarded it and destroyed the rooms at the top of the platform (now restored). Two cannonball holes at the eastern wall of the platform serves as a reminder of that event. As an astronomy buff, I would like to see this site inscribed on its own but most likely it won’t happen. China can however make a serial site of ancient Chinese observatories. This site, the equally important Beijing Ancient Observatory and the much older Taosi observatory included. Certainly, they can make an OUV case for the long Chinese astronomical tradition and important contributions. I really enjoyed exploring Dengfeng. Each site is well signposted with clear explanation of what they are and how they contribute to the theme. There’s also a plaque at each site showing its location relative to the purported center of heaven and earth. As for transportation, only the Shaolin Temple and Zhongyue Temple are directly connected by tourist buses as of my visit. Going to the other sites involves taking a cab as public transport is challenging without Mandarin knowledge. Another pleasant surprise for this trip is that my hotel offered a complementary Kung Fu show. Students from one of the Kung Fu schools performed for an hour. I was like a kid, wide-eyed enjoying the performance. Site visited April 2017. The historic monuments of the city of Dengfeng was a pleasant experience. There were absolutely the smallest amount of visitors among the sites that I have visited in China. The places were calm and quiet and some of them are surrounded by beautiful nature. I visited five of the eight inscribed properties. First of all I must tell that in this review I'm not going to mention anything about visiting the Shaolin Temple. Actually I had heard nothing but bad things about it being a major tourist trap. So I deliberately left that off from my itinerary. I was curious to see what other things there are in this WHS. Despite of being named after the city of Dengfeng, this inscription is all about Mount Songshan and the monuments connected to and located around it. Mount Songshan is one of the most sacred Taoist mountains of China. The city of Dengfeng at the foot of Mount Songshan is a spiritual center where the most important temples and religious institutions are located. I would say sarcastically that it is quite difficult to get to the city of Dengfeng. Not because of bad transport options, actually those are very good, but because everyone assume that you want to go not to Dengfeng but to Shaolin Temple. All the people in Luoyang is trying to push you to Shaolin, even the ticket salesman at the bus station counter. So after some worthless efforts to buy a bus ticket to Dengfeng I just walked directly to bus platforms and asked some people a bus to Dengfeng. Also there someone tried to direct me to a Shaolin bus. After all the hassle I found my way to a Dengfeng bus. The bus trip from Luoyang took almost two hours, half of which goes to traffic jams in Luoyang. Dengfeng, one of the early capitals of China, is nowadays a sleepy provincial town. From the bus station it is three kilometres to the gate and ticket office of Songyang Scenic Park. You can take a taxi to the gate and after that either walk uphill or pay a small price to the cars that offer rides to visitors. The quite modest ticket price of 80 RMB includes a nice and informative booklet with a map of area and descriptions of each site. Songyang Academy and Zhongyue Temple require additional 30 RMB entrance fee. It is worth mentioning that the slopes of Mount Songshan are full of interesting temples and other religious places, not just these eight selected World Heritage Sites. It would have been nice to hike also to the higher parts of the mountain but I didn’t have time for that. Mount Songshan is also UNESCO Global Geopark. The Songye Temple Pagoda was the nicest site among those I visited. It is absolutely beautiful building surrounded by lushly vegetated mountain nature. 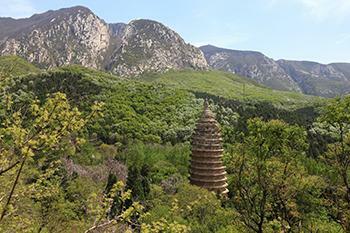 This pagoda is 37 metres high and it was built AD 523. It is one of the oldest pagodas in China and oldest known Chinese brick pagoda. It is known as "the first Chinese tower". For those who love photography it is really worth climbing to the hill outside of temple because there are beautiful and photogenic views to green slopes of Mount Songshan and the top of pagoda. Songyang Academy of Classical Learning is nearest site to the park gate and the city centre of Dengfeng. This institution of higher learning was one of the four great academies in ancient China. The prominent feature of Songyang Academy is its steles. The most important stele is so called Tang Tablet which is important in Chinese handwriting history. There are also lot of other steles around the temple courtyard. Inside the temple area are also two 4500 years old cypress trees that are said to be oldest trees in China. While the other places I visited are easy to visit going downhill starting from Songye Temple, the Huishan Temple is to the other direction towards the Shaolin Temple. It was a long detour and although it is considered one of the four main temples of Mount Songshan I didn't find it very interesting. There were least visitors among the Dengfeng sites. I was maybe one of three visitors at the temple. The building of Qimu Que Gates was closed at the time of my visit. Basically it includes Han Que gates built in AD 123. There are only 34 ancient stone Han Que gates in China, three of which are at Mount Songshan. 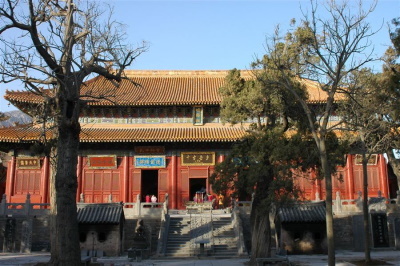 The huge Zhongyue Temple is maybe the centerpiece of this WHS along with the Shaolin Temple. Taishi Que Gates built in AD 118 in front of Zhongyue Temple are one of three ancient Han Que gates of Mount Songshan. Zhongyue Temple has been originally built on the site of Taishi Shrine. Since then the temple was rebuilt many times. During the Qing Dynasty it was restored according to the Forbidden City in Beijing and it is also called the ”Small Forbidden City”. There are 39 buildings on the multiple courtyards and hundreds of ancient cypress trees. The main building of the temple, the Junji Hall, is the largest building of the five sacred mountains of China. With my review I don't mean to say that don't go to Shaolin Temple at all but to encourage people to check out what other things there are to see on this WHS. I found the historic monuments of Dengfeng worth visiting, especially Songye Temple Pagoda and Zhongyue Temple, and also the Gaocheng Observatory should be of interest. Moreover, those sites are quite peaceful places with few tourists which is very unusual in China. Together with the beautiful slopes of Mount Songshan they form very nice ensemble. Epic Subtitles: in "The Centre of Heaven and earth"
Extended from original TWHS: Originally only Songshan. An extended nomination followed a referral of the original nomination in 2009.